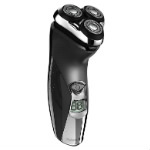 The Remington R5-6150A electric shaver is a three rotary style shaver with LCD screen. It comes in a black finish with grey highlights, and is affordably priced, for those on a strict budget but who still wish to have the best shave possible. There are not a lot of frills with this shaver, so you can only expect to get the basics which will get the shaving job done each morning. Remington utilizes their patented pivot and flex technology, with titanium coated blades to minimize discomfort. 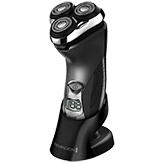 The shaver will adjust to the curves and contours of any type of face, or neck. 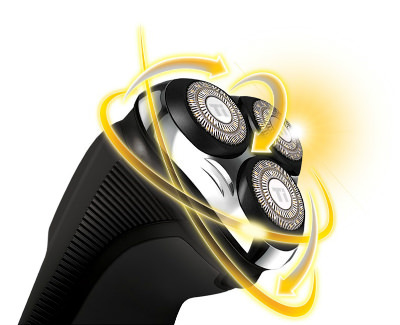 The titanium coated blades will extend the life of your Panasonic shaver, as they’re sharper, and will resist becoming dull. This means that you won’t have to replace the entire rotary head as often. A power button works to turn the electric shaver on or off. The digital battery display will inform you how much battery charge you have left, and whether it needs to be charged up immediately. 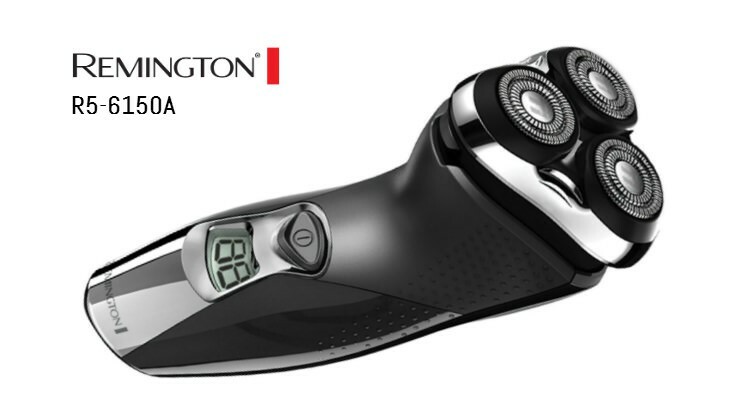 The Remington shaver stacks up well against other more expensive shavers as long as you only compare actual shaving performance, and not accessories included, or features. It holds a 60 minute runtime, which should last you nearly two weeks. If you forget to charge it up, a quick five minute charge will provide you with enough shaving time to complete your face until you can get it plugged back in again. It’ll take two hours to get it charged up for a one hour battery life. A handy pop-up trimmer will allow you to get around those hard-to-reach spots, such as the sideburns, beard, and mustache. No need to find the separate trimmer in your bathroom drawer, as this trimmer simply pops up from the head of the shaver. 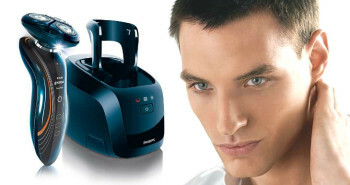 The Remington R5-6150A shaver is easy to wash. The head moves back, so that you can simply rinse it under the tap to get out any hairs, soaps, and other residue. Shake it out, then place on a towel to dry. It’ll be ready to use by the next time you need to shave. The Remington R5-6150A is perfect for traveling. You can either charge it up in advance and pack it, and leave the cord at home, or you can bring everything with you, and charge it up there. It has a worldwide voltage, so it’ll work at any country in the world, though you may need to purchase plugs. There’s no carry case included, so you’ll need to provide your own. There’s also no protective rotary plastic cover, so you’ll want to ensure that you carefully pack your electric shaver in your bag. What comes in the shipping box: The Remington R5-6150A electric shaver with attached pop-up trimmer, and the charge/power cord. 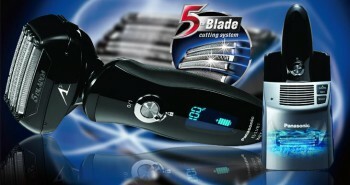 If value in an electric shaver is important for you, the Remington R5-6150A shaver is worth a look. You’ll end up with a smooth clean shave that appears like you spent a lot of money on your electric shaver. There are few extras, but this shaver will do what it’s designed to do–provide you with the best shave possible. This is a great entry model for the brand, particularly for those who haven’t tried a rotary style shaver before. If you’re finding you enjoy the shaving experience, you may wish to splurge for one of the pricier models of the Remington brand that has additional features. Washable: Clean quickly and easily under water.